We often receive comments that while our microchip photos are beautiful and interesting, it is completely unclear how integrated circuit implements basic elements and form larger circuit. Of course it is impossible to do a detailed review of an 1'000'000 transistor chip, so we've found simpler example: ULN2003 - array of Darlington transistors. 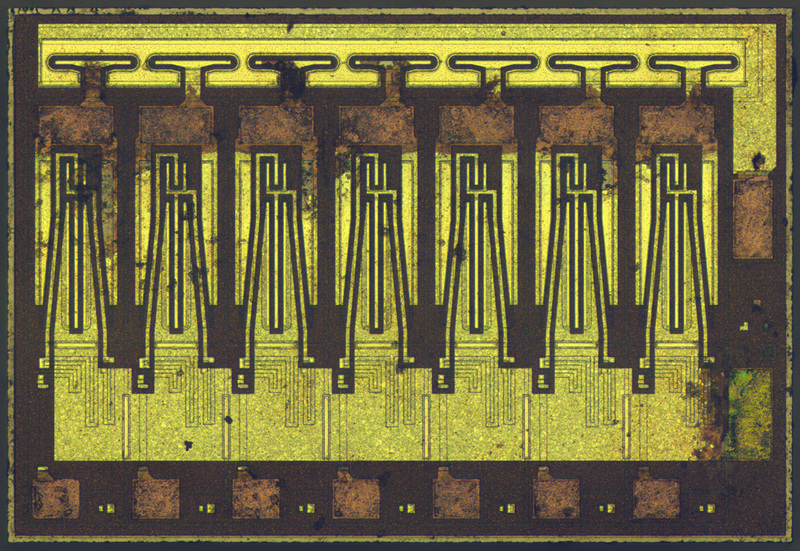 Despite it's simplicity this microchip is still widely used and mass manufactured. 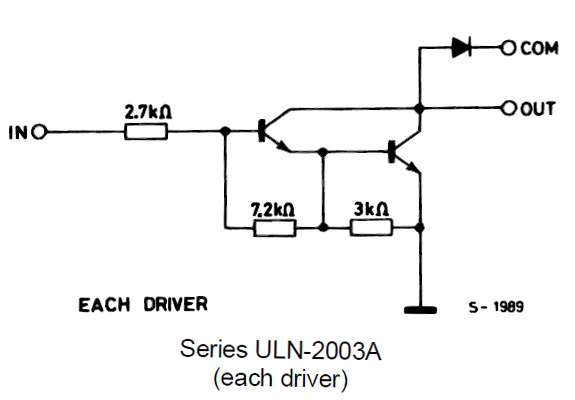 ULN2003 contains 21 resistors, 14 BJT transistors and 7 diodes. It is used to control relatively high load (up to 50V/0.5A) from microcontroller pin. Canonical use case - controlling segments of large 7-segment LED displays. Colors are more saturated, metal under contact pads is damaged by acid and became brown. 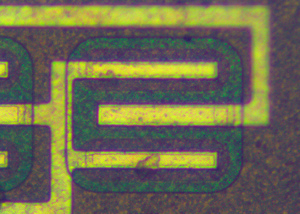 Die size is 2.53x1.71 mm. And now closeup of 1 channel with all elements annotated. I'll leave it as an homework task to figure out mapping between schematic and layout. Note that while common diode connection is called "Diode GND" it's usually connected to supply voltage - so these diodes make sure that output voltage would not be higher than supply voltage (this might be important for inductive load). Thin base goes under emitter. While emitter and collector are both n-type silicon, they are not equivalent. Doping concentration and thickness are optimized for "current amplification" in 1 direction only. 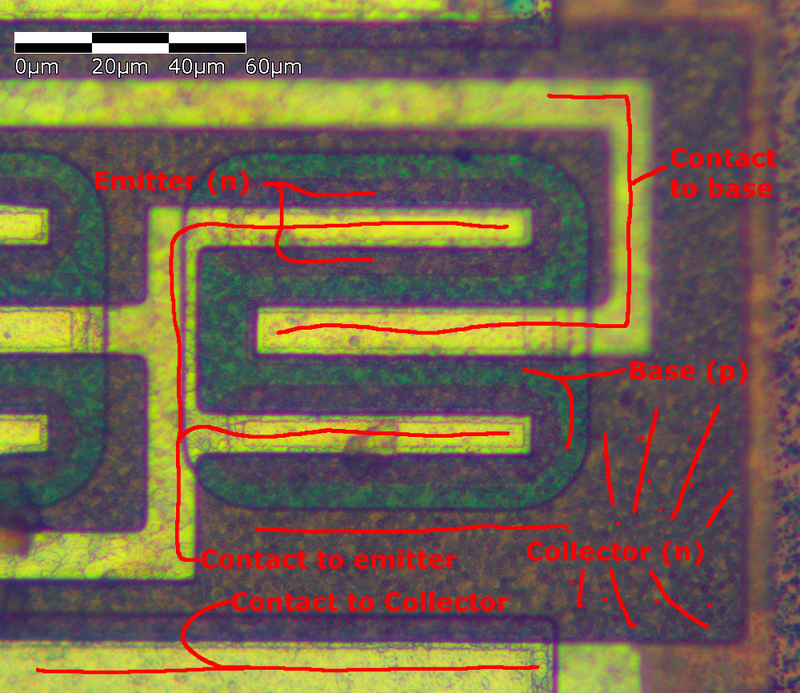 Now we can take a look at individual transistor and try to figure out how it is designed. P and N-type silicon has slightly different color. This difference is quite small, but after cranking up saturation and contrast almost to the maximum we can clearly distinguish between them. Don't worry about dual emitters - they work just like 1 with combined area. In order to avoid aluminum interconnect shorting wrong parts of the transistor - it is covered by a layer of insulating transparent glass. This glass has holes right above places where interconnect is supposed to contact the transistor. You can clearly see this on the following photo made with a lens that has narrower depth of focus: base contact is out of focus as it's laying higher, on the transparent glass.